As the latest wave of revolutionary uncertainty sweeps across the Middle East, Iran remains one of the region’s biggest question marks. The Islamic regime that temporarily crushed the Green Movement after Iran’s controversial presidential elections of 2009 still faces serious internal challenges to its power, with no clear indication of how events will play out. Few outside countries have more at stake in the evolution of Iran’s political situation than the United States, which has been in a state of open enmity with the Islamic Republic for more than three decades. Threats of Iran-backed terrorism, Tehran’s apparent nuclear ambitions, and its evident aim of destabilizing American allies—chiefly Israel—are perpetually high on the list of US concerns in the region. Why is Iran so important to the US? What explains the enduring animosity between the two countries? Answers to these and other questions about the United States’ position in the region today can be found by looking back to the Cold War. Outside interest in Iran actually extends much further back in time than the Cold War. For centuries, Persia, as the country was once known, attracted the attention of rival great powers from the ancient Greeks to the Mongols, and from the Arabs to the Ottomans. In the latter nineteenth century, Russia and Britain struggled for influence. Situated at the head of the Persian Gulf, the country’s location offered year-round access to warm waters for Russia’s navy, which was generally hemmed in by icy northern seas during the winter months. For the British, Persia served as both a gateway and a defensive buffer for prized holdings and resources in India and the Orient. Iran became an even greater asset early in the twentieth century when the British, thanks ultimately to a decision by First Lord of the Admiralty Winston Churchill, switched from the use of coal to petroleum to fuel their navy. Both of these circumstances—Iran’s location between the USSR and the Persian Gulf, and the presence of major oil reserves—guaranteed the country’s importance during the Cold War. In addition, a third factor came into play: the emergence, even before the end of World War II, of the global military and ideological competition between the United States and the Soviet Union. Fear of losing influence in a vital part of the world to Soviet-led Communism motivated much of American foreign policy for the next several decades. American sentiment about competition and democracy was spelled out, sometimes in almost Biblical terms, in conceptual documents like NSC-68 and in numerous policy papers over the years. In two key incidents in Iran from the post-war period these precepts were plainly evident, and produced consequences for the United States that were in some ways utterly unanticipated. At other moments later in the Cold War, described further below, Washington’s fixation on the Soviet threat left it unprepared to deal with crises of local origin that were equally significant for America’s standing in the region. The first of these earlier episodes unfolded at the end of the Second World War when the USSR threatened to abrogate its agreement with Britain and Iran to remove its large troop presence from Iran’s northern province of Azerbaijan within six months of the cessation of hostilities. Anxious to gain an oil concession that would balance Britain’s privileged access in the south of the country, as well as to create a buffer zone in a vulnerable border region, Joseph Stalin planned to solidify Soviet influence in the southern Caucasus region—perhaps even to annex part of Azerbaijan province, according to Soviet archival records—but met surprising resistance from President Harry Truman, who gave a range of support to the young Shah of Iran, Mohammad Reza Pahlavi. Stalin ultimately decided to withdraw from the country in late 1946. The actions of the United States were seen as a sign of genuine respect for the rights of sovereign states—highly unusual for a major power—and made a powerful impression on the Iranian people. To this day, the Azerbaijan crisis accounts for some of the positive views many still have of the United States. Less than a decade later, however, a second major incident dramatically changed many Iranians’ opinion of the United States. In 1951, Iran’s recently elected prime minister, Mohammed Mosaddeq, nationalized the country’s petroleum industry, long the domain of the British-dominated Anglo-Iranian Oil Company (AIOC). The move pitted the two governments against each other in a bitter political fight, leaving the United States once again to play the intermediary. But while the Truman administration had tried to work with both sides, President Dwight Eisenhower and his advisers quickly concluded that Mosaddeq represented the problem rather than the solution to the crisis. Based strictly on Cold War calculations, Eisenhower authorized a preemptive covert operation to oust Mosaddeq before Moscow might have an opportunity to do so. The coup in August 1953 was carried out at US and British instigation but relied on a variety of Iranian groups and individuals for its eventual success. The overthrow achieved the immediate objective of restoring to the throne the Shah, who had fled the country during the turmoil, and replacing Mosaddeq with a more amenable figure. For the next twenty-five years, Mohammad Reza Shah remained in power and made significant contributions to the interests of his superpower patron. But even though the coup had had the support of significant segments of Iranian society at the time, it came to be seen by many Iranians as a sea change in American conduct—from munificent protector of smaller countries to archetypal great power pursuing its own interests regardless of the wishes of local populations. This view of the United States gained currency inside Iran over the course of the Shah’s reign as he proceeded to exercise more and more arbitrary and dictatorial power at the expense of his subjects with little visible effort at restraint from Washington. In fact, Presidents Eisenhower, Kennedy, and Johnson did press the Shah repeatedly to enact reforms, but that strategy effectively ended with the assertion of the Nixon Doctrine in 1969. Reflecting the heavy strain on American military resources caused by the Vietnam War, the new doctrine relied on regional powers to act as the first line of defense against potential Soviet expansionism. For the next several years, the Shah not only gained access to sophisticated American weaponry he had long coveted, but also obtained tacit White House permission to forgo any serious effort at reform. By the 1970s, conditions inside Iran that were purely local in origin—with no connection to the Cold War—had begun to emerge that the United States was ill-equipped to address. Internal resentment against the Shah’s political and economic policies was building to a peak (and extending to his US sponsors), but the depth of the problem escaped the notice of American decision-makers. Led by Ayatollah Khomeini, a fierce public critic of Iran’s reliance on American backing who had been exiled for years for his views, Iran’s growing anti-Shah sentiments burst into open revolution in 1978–1979. After Khomeini’s triumphant return to Iran in early 1979 it was only a matter of months before the revolution gelled in the form of a theocratic state, not surprisingly characterized by significant anti-American overtones. 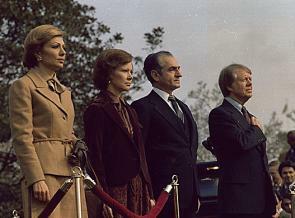 In the context of the Cold War, the revolution appeared to many Americans to signify the “loss” of Iran to Soviet influence, a loss that was magnified by the USSR’s invasion of Afghanistan in December 1979. In fact, Moscow was never able to gain a foothold in Iran because of the Islamic Republic’s deep suspicion of Russia’s history of aggressive behavior and the religious leadership’s antipathy for official Soviet atheism. This did not necessarily bode well for Washington, however. Instead, it was a sign of the rise of another factor in international politics that would have implications beyond the Cold War: Moslem fundamentalism, which not only incorporated the concept of national sovereignty (captured in the phrase “neither East nor West”) but was animated at its core by the ambition of creating a theocratic state and spreading Islam across the region. Hand in hand with the revolution came another event with momentous implications for US-Iran relations: the storming of the US embassy in Tehran and the seizure of American hostages in November 1979. Iranian accounts indicate that the country’s leadership was initially unaware of the student-led plan to assault the embassy (which the students claimed was a response to years of perceived US antagonism dating back to the 1953 coup), but Khomeini was quick to embrace the move for domestic political reasons. While it helped to consolidate radical rule over the country, however, the takeover also created a political crisis for Iran, landing it in long-term diplomatic isolation, and engendering extraordinary enmity from Washington. The bitterness of the hostage crisis continues to poison official American attitudes toward the Islamic regime. One other episode from this period was critical in forming the current antagonistic relationship between Iran and the United States. From 1980 through 1988, Iran and Iraq fought a horrific war initiated by Saddam Hussein’s opportunism but fueled by historical animosity, among other factors. In retrospect the record is clear that the United States sided with Baghdad (as the lesser of two evils), providing political, economic, and even military support for Saddam’s war effort, including tacit acquiescence to Iraq’s use of chemical weapons and missile attacks on Iran’s cities. Toward the end of the conflict, US forces directly engaged elements of Iran’s navy and Revolutionary Guards, and in July 1988 a US naval ship mistakenly shot down an Iranian civilian jetliner, killing all 290 on board. Ironically, these encounters helped lead to a cease-fire by persuading Iran’s leaders that America would stop at nothing to defeat them. The Iran-Iraq War took place during the Cold War but it had virtually nothing to do with the East-West conflict; it was a local dispute sparked by indigenous factors. Washington’s actions, however, did grow out of the American mindset of that era: a desire to protect the flow of oil from the Persian Gulf and a determination to block the Soviets from gaining influence in the region. Regardless of each side’s intentions, the war produced a number of enduring results. One was that the leaders of Iran’s revolution were able to link their cause to the survival of the nation itself. Another was the elevation of the status of the Revolutionary Guards, eventually rivaling even the power of the clerical leadership. (The country’s current combative president, Mahmoud Ahmedinejad, was a member during the war.) Still another outcome, of direct relevance to US standing in the region, was the cementing of the perception among the country’s hardliners of Washington as an irreconcilable enemy of the Islamic Republic. Although the Cold War ostensibly came to an end twenty years ago, the United States still confronts circumstances in Iran that emerged during that crucial period. Some are unchanged—the critical need for oil, for example. Other challenges have been altered or eliminated, but new ones take their place. The Communist threat has disappeared, for instance, but the menace of international terrorism has strengthened. Meanwhile, certain US strategic concepts rooted in the ideological thinking of the Cold War have been temporarily revived. George W. Bush’s national security doctrine reasserted Washington’s Cold War–era determination not to permit the emergence of another rival power (like the Soviets, or in an earlier era, the Nazis) to threaten American interests, and echoed Eisenhower’s concept, employed in Iran in 1953, of preempting a perceived threat. Although current US strategy no longer focuses on some of these ambitious concepts, their impact can be seen in the history of American involvement in the Middle East and continues to be felt across the region. Malcolm Byrne is Deputy Director and Director of Research at the National Security Archive. His publications include The 1956 Hungarian Revolution: A History in Documents (National Security Archive Cold War Readers), The Iran-Contra Scandal (The New Press, 1993), and The Chronology: The Documented Day-by-day Account of the Secret Military Assistance to Iran and the Contras (Warner Books, 1987).